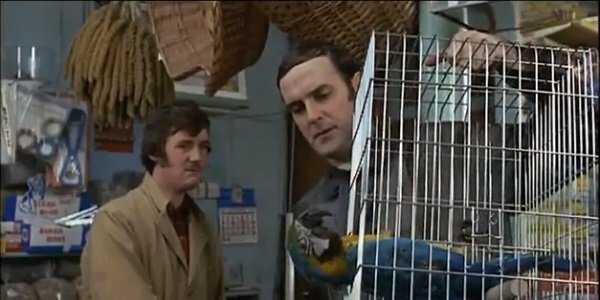 I’ve been a fan of Monty Python for more years of my life than not, and thus complacency had set in with the notion that the five surviving members would never again reconvene under the moniker. And then, astoundingly, it happened recently in the form of Monty Python Live (mostly), a limited run of live performances in London’s O2 arena. 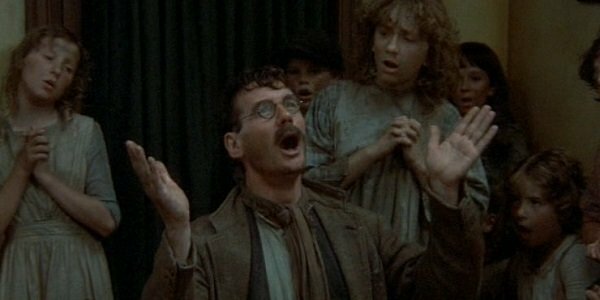 The last of these performances was simulcast in theaters around the globe, allowing worldwide communities of Python fans to get together and sing "Always Look on the Bright Side of Life" with the group for one last time. Pardon me, I have something in my eye. Luckily, this event wasn’t exactly a One Time Only affair, as Fathom Events will be showing encore screenings of the performance on Tuesday, July 22, and Wednesday, July 23. (Find your closest theater here.) Assuming you guys aren’t getting your geek on in a completely different way at this year’s Comic-Con, Monty Python Live (mostly) should be the only thing you’re looking forward to doing this week, and here are five reasons why you need to gather a group of your closest Gumbys and see it while you still can! It’s Monty Python Live, For Graham’s Sakes! 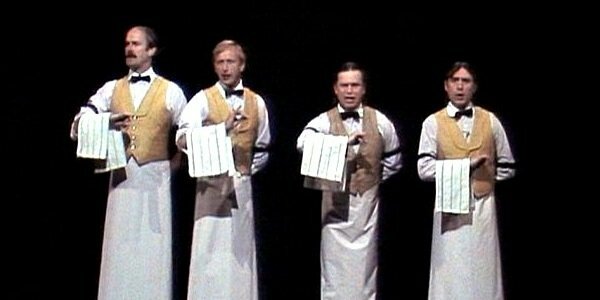 While Michael Palin, John Cleese, Eric Idle, Terry Jones and Terry Gilliam have all gotten together over the years for promotion of all things Monty Python and Idle’s recent run of amazing musicals, it’s rarely been as an entire group, and it’s even rarer that they actually "perform" anything. (The upcoming sci-fi comedy Absolutely Anything is something completely different.) Audiences have essentially waited 34 years, since 1980’s Live at the Hollywood Bowl performance, to see this many Python members sharing the same stage and performing the troupe’s greatest bits (and then some). 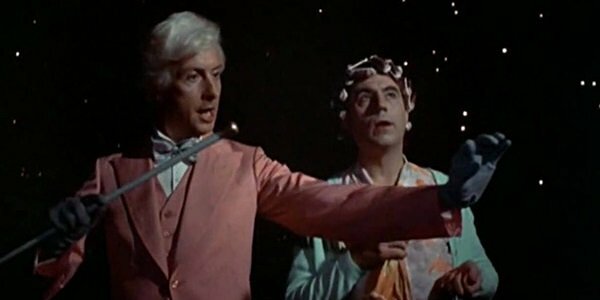 If we’re counting "in spirit" performances, the deceased Graham Chapman was absolutely a part of the show, both in fun references and in use of stock footage, and you’d better believe the honorary seventh Python, the still dazzling Carol Cleveland, was utilized as often as one would have hoped. It goes without saying that watching five men in their 70s dancing around a stage, sometimes in revealing women’s clothing, is not always a recipe for success, but this quintet are nearly as sharp as they ever were. With some fabulous exceptions, Monty Python delivered a flawless return to the surreal sketches and witty ditties of their youth, effortlessly segueing their most iconic bits with the best (and least legally binding) post-Flying Circus material with madcap stage design utilizing a giant screen for visual gags and song lyrics. Plus, the pre-show footage showed off some behind-the-scenes rehearsal footage, as well as trivia questions about the group’s work. If I had one complaint, it’d be that I’m not still sitting there watching it right now. Having developed both Spamalot and Not the Messiah, Eric Idle has proven his excellence in yet another area of music, and it was a lewd and laudable treat to see just how many of Monty Python’s greatest songs got full-blown musical numbers, while many more were present in instrumentals and as segues between set pieces. The orchestra used was more spot on than the actors were, all things considered, and it was wonderful to hear songs like "Eric the Half-a-Bee" and "Never be Rude to an Arab" make their appearances in lyric-free form. Have you ever paid a lot of money to watch a music artist and they failed to play the songs you wanted to hear? 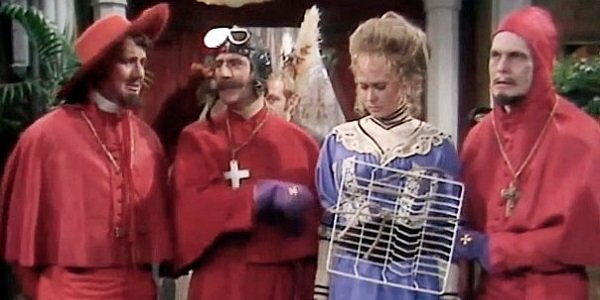 None of that happened during Monty Python Live (mostly), as the group smashed together all of the expected sketches, such as "Spanish Inquisition" – NO one expects the Spanish Inquisition – and "Dead Parrot," and each was presented with just the right amount of streamlined tweaks and updates. For instance, the famed "Poofy Judges" sketch includes references to John Cleese’s many divorces, and the characters sometimes stepped from one sketch right into something else. Watching someone screw up during a ballet or fall out of character in a serious production is never what the audience wants, but it was more than welcome to watch these five guys breaking character when they felt a laugh coming on. There were a few times when it was obvious a line or two had just completely gone out of the actors’ heads, or Palin would stumble during one of his more elongated rants, but those come with the territory of performing genius material years past one’s prime. I was honestly surprised by how few errors there were. The more fancy-free bits occurred during the "Crunchy Frog" sketch and during "Dead Parrot." And perhaps it’s no surprise that Cleese is the one who loses his verbal footing in both. One such derailment involved Terry Gilliam’s inability to hold onto his meal, while the other incorporated a somewhat lengthy bit of fun-poking at the Daily Mail, whose opening night review of Monty Python Live (mostly) was more negative than the Knights Who Say "No." ("Ni.") In both cases, however, it was great to sit back and consider just how long it has been since all of this morbid wordplay was first written, and the history that these men have experienced together. To go along with the modern references sprinkled into the act, Monty Python Live (mostly) contained several genuine surprises on its quest to provide laughs. One involves a couple of new verses added to one of their classic songs, and the new material is every bit as good as the old stuff. (The shock value is part of the fun.) And you might be surprised to find a few famous non-Python faces sprinkled into the show as well. The always hilarious comic Eddie Izzard, whose history with the troupe goes back many years, shows up where you least expect him to, and the "Blackmail" sketch includes another comedy superstar. Though neither adds much to the show as a whole – and it looked like they were just as surprised to be there as audience were to see them – it was still excellent to have some left-field additions to the fun. More impressive than that duo, however, are physicists Brian Cox and Stephen Hawking, who each provide their own unique commentary for the "Galaxy Song." It's sincerely one of the greatest cameo segments in pop culture history. Have I convinced you to buy your tickets yet? What if I told you spam spam spam spam wonderful spam spam spam spam wonderful spam?